The Frugalista Fatshionista: Faith 21 is changing it's name? to Forever 21 Plus Sizes. Wow. Cutting Edge stuff right there. If that's the case, shouldn't it just be Forever 21, available in size 0-3x? 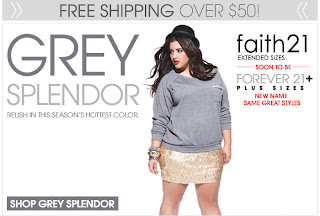 If you're going to try to homogenize it so that big girls lose their identity, do it properly. I personally am a little more than just irked by the impending name change, especially considering that the straight sizes have several brands to themselves (Heritage 1981, Love 21, Twelve by Twelve, and of course, Forever 21), and we can't even get one stinkin' brand to ourselves. I totally agree...... I love faith 21 and I liked that it had its own name.... I really dont get the logic behind it... the words "plus size" are just so ugly.... you know ..... I could even deal with Forever 21 extended sizes but I really dont like the new name change!!! I feel you, ShoppingQueen. I usually wear a 22/24, and I find that I can just fit comfortably into Faith 21's 3x as far as tops and dresses, but if the chest area is cut restrictively, forget it. I'm glad to have the option for cheap throwaway clothes as a bigger girl, considering how ultra expensive plus sized fashion tends to be, but I agree that they have to work on extending their sizes further and really making the cuts/fits work for plus size, not just making the regular clothes with more fabric. It's a relatively new brand, so hopefully they'll "get it" soon. I suggest writing your suggestions and/or gripes to their corporate offices, believe it or not, merchants listen! They know that by not providing consumers what they want, they lose opportunity to make money off us, and what is the fashion industry if not a business?